Santorini has been on my travel bucket list for years and I have spent many hours scrolling others photos of this beautiful island wishing it was me who was there. Well last month this dream came true and my husband and I finally found ourselves lost for words as we stared out at the view across the caldera, the view I had so often swooned over online. It doesn't matter how many photos you look at, nothing quite prepares you for seeing that view in person. To say it is incredible doesn't even do it the justice it deserves. There really are no words! We spent our first four nights at the beautiful Cocoon Suites in Imerovigli. Our room was perfect and the entire hotel was spotlessly clean. We had a lovely jacuzzi tub on our terrace which was great for cooling down in after being in the heat. It was just amazing to be able to open your doors and have that view on your doorstep! My one slight gripe with this hotel was that many of the rooms didn't have sun loungers which I hadn't realised at the time of booking and the deck chairs provided weren't that comfortable for sitting in for very long. Aside from that everything was perfect! I think the fact that we couldn't really lounge in the sun all day comfortably meant that we got out and explored more than perhaps we would have done. I really liked Imerovigli which, after exploring the rest of the island, we soon realised is a lot less busy than the other towns. There seems to be a much slower pace of life there and it was considerably less touristy than both Fira and Oia. There were a few good restaurants and cafes but not a great deal in the way of shopping. I think this is the perfect place to stay if you want to enjoy things less crowded and if you take a short walk around the edge you can also see the sunset from Imerovigli which is beautiful. The next four nights of our trip were spent in Oia which is where everyone flocks to in the evening to see the spectacular sunsets. As you can probably imagine it's hugely popular with tourists so the footpaths and the roads are really busy but this was my favourite town on the island for shopping and eating. There's a really great selection of restaurants and cafes to choose from in Oia and an abundance of small boutique shops to mooch around. We found it really easy to lose time wandering around all the cobbled streets in the evening and this is the place to go to capture some picture perfect Santorini photos. Whilst in Oia we stayed with White Pearl Villas who offer a variety of different self catering villas in this area. We ended up upgrading our room so that we had an outside tub but it meant we stayed at a different villa each night we were there. It meant a little upheaval every day but it was worth it for the comfort factor and we got to see the difference in some of the villas we stayed at. The Sunset Chaser was the biggest villa which had an incredible view of the sunset in the evening. It certainly beated battling the crowds in the town for a glimpse of the sun going down! My favourite villa during our stay here was however the Pure Bliss one which in my opinion had the best layout and nicest interior. For our final two nights in Santorini we stayed over on the other side of the island at the popular Kamari Beach. This is definitely the more affordable side of Santorini as there is no view of the Caldera but what you miss out on there you gain with access to a beautiful beach and clear blue waters to swim in. Kamari beach reminded me of other typical Greek resorts i've been to before with the main promenade packed with shops and restaurants. It also had some Brit factor with an Irish pub and full English breakfasts available! For our time at Kamari Beach we stayed at the Bellonias Villas which is a great hotel situated right on the seafront. I picked this hotel mainly for its gorgeous outside pool area which is really contemporary and comfortable with lots of double sun beds to choose from. To be honest it was exactly what we needed after having spent the majority of our holiday in the main towns. I had been desperate to go for a proper swim and feel the sea breeze on my skin. We definitely got to experience the best of both worlds by splitting our stay between the Caldera view and the beach and i'd recommend you to do the same. Our time at Kamari Beach was really relaxing and as we had already done all of the sightseeing on the island this was the perfect time to just stop and switch off from everything. We spent our time between the pool and the black sand beach, swimming, sunning ourselves and sipping on some cocktails. It felt like a completely different holiday to the first part of our week and it felt like we were somewhere else altogether. 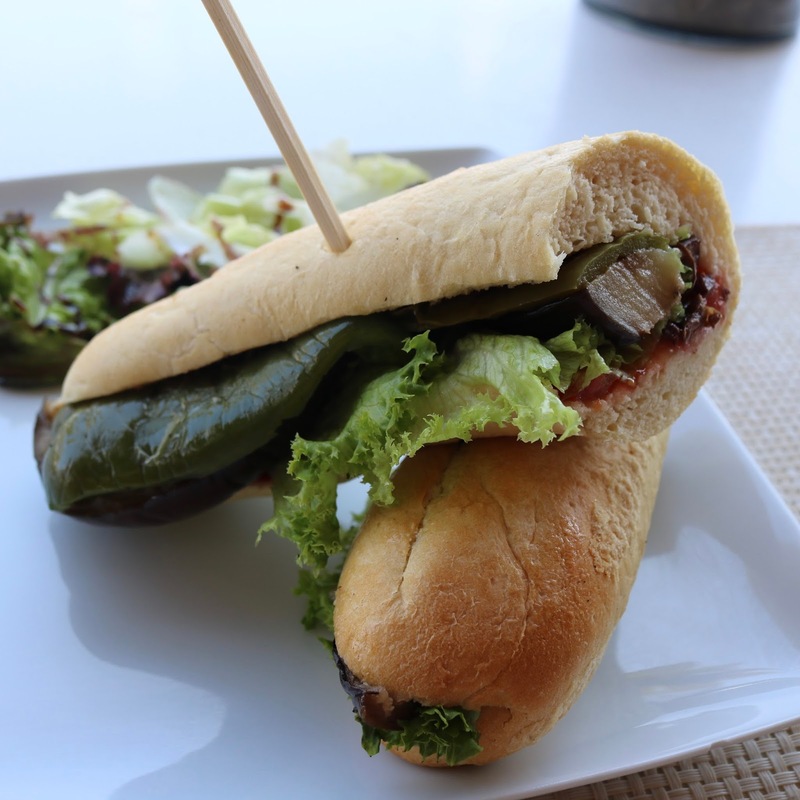 There is plenty of choice for vegetarians and vegans in Santorini so do not be put off coming here if you think it is all about meat and dairy. Many of the restaurants we visited had similar menus to each other and it was easy to ask for any ingredients such as cheese/yoghurt/honey to be removed. I also found that many items on the menu were vegan friendly even when they weren't labelled as so. Most places serve pasta, salads, potatoes etc and many meals were enjoyed as a mix of mezze plates which is my favourite way to enjoy dinner! I'm not sure that they completely understand what vegan is out there so just be prepared to improvise a little and you will be fine. Here are some of the restaurants we ate at and enjoyed a good meal. I didn't take photos at all of them because it was mostly dark and difficult to but hopefully this list will provide you with a general idea of what the food in Santorini was like, and some decent recommendations if you are planning a trip there. We ate at Anogi on our very first night in Santorini and after doing a quick Trip Advisor check this seemed like a suitable place for us to visit. There's a lot on the menu here including some traditional Greek dishes and vegetarian / vegan friendly ones. We went in for a mixed mezze of food including a Greek salad (with feta cheese removed), an aubergine dip, Santorini tomato balls, chips and bread. I had seen some great reviews of Avocado and the name of this restaurant alone completely drew me in! This was the first restaurant we visited that seemed to have a coherently labelled menu with 'potentially vegan' being an option. We enjoyed a more traditional two course meal here which started with an avocado salad which had pieces of orange in it and it was an amazing combination. For my main I went for a simple tomato pasta dish which was also really enjoyable. My husband had seen Pitogyros whilst we were exploring Oia and we were impressed to find that they offered a vegetarian option which was basically chips and salad in a pitta wrap. It was so good as a quick cheap bite to eat at lunch time, although a little off putting as a vegan sitting inside a kebab shop! I had seen Karma whilst wandering the streets of Oia and it looked very cute and romantic inside. Luckily they were able to squeeze us in one evening as we didn't have a reservation and we had a really great meal. I had bbq vegetable skewers with rice and there were a few other veg friendly options on the menu. Candouni gets very busy so I would advise booking a table or going in early before sunset time. When we visited the special of the day just so happened to be giant vegan balls with potatoes which were pretty amazing! I was shocked that the special was vegan and the staff here seemed really clued up on what was vegan friendly. My husband enjoyed a vegan tomato spaghetti and we shared another salad. I think this was my favourite restaurant out of our entire stay in Santorini and I'm sad I don't have any photo evidence but it was so dark there I really couldn't get the pictures I wanted to. Anyway, this laid back restaurant is just outside the main hustle and bustle of Oia and is in the loveliest of locations right by the sea. This is a mezze restaurant so all the plates are designed to be shared and the food was just to die for. In fact we were really tempted to go back here again! We had guacamole with tortilla chips, roasted potatoes, hummus with pitta and salad. There was also live music and dogs roaming around - what could be better!? Falafel Land in the centre of Fira was a dream come true for us! This was probably our second favourite place to eat on the whole island and again, we wanted to go back for more. Everything on the menu was vegetarian or vegan and everything was clearly labelled. It's more of a quick cheap lunch vibe than an evening out but the food was amazing. I noticed Chill Box whilst wandering around Fira and I assumed there wouldn't be any vegan friendly options but thankfully I was wrong. Although this is a predominantly frozen yoghurt and ice cream shop they do have a few dairy free sorbets to choose from and quite a few toppings too. I was really pleasantly surprised, so much so that we went in for way more sorbet than we could eat! I chose a lemon sorbet and topped it with cherry coulis, roasted almonds, dark chocolate sprinkles and an oreo. One pot here set us back a whopping €9.00! I think they just gave us the biggest size without asking us so we felt a little ripped off but still - vegan friendly sorbet with toppings! Who's complaining!? JoJo's is a really great pool / beach club and it's the perfect spot if you don't have access to a pool or sun loungers as they have everything here that you need, including the beach outside too. There's a minimum spend for the double day bed loungers of €60 which is worth it if you plan to spend all day there with eating and drinking. The cocktails here were great and there was a vegan friendly veggie baguette on the menu so I was happy enough! Tranquilo has a great laid back hippy beach club vibe about it and their menu is just bursting with veg friendly options, so much so that it was difficult to choose what to eat. I wasn't hugely hungry the evening we visited here so I just went for a fried vegetable rice and some guacamole but our entire experience was really enjoyable. My only advice would be to go there on an empty stomach and the giant sized salads looked incredible. Our favourite spot to eat at Kamari Beach was actually our hotel restaurant. There are so many restaurants along the main promenade all competing for your custom that it's almost overwhelming knowing where to start. So we took the easy option at ate close to home! There wasn't a huge amount of veg friendly food on the menu but what there was we really liked. So much so that we went back daily! We shared a roasted veg focaccia sandwich, potato wedges and an avocado salad all enjoyed right by the sea and with the best view. It was actually way easier eating vegan in Santorini than I had expected it to be and with the weather so hot during our stay it actually made me want to eat salad every day which is quite unlike me. Our favourite local dishes which are well worth trying was 'Fava' which is basically a bit like hummus made from yellow beans and enjoyed with bread. Santorini tomato balls were also another favourite dish of ours which were on the menu almost everywhere. They're like onion bhaji's but less fragrant and more tomato based, and very yummy. One thing that did upset me whilst in Santorini were how the donkeys are treated. I talk about this more in my vlog and it was horrible to see first hand such outdated practices taking place. 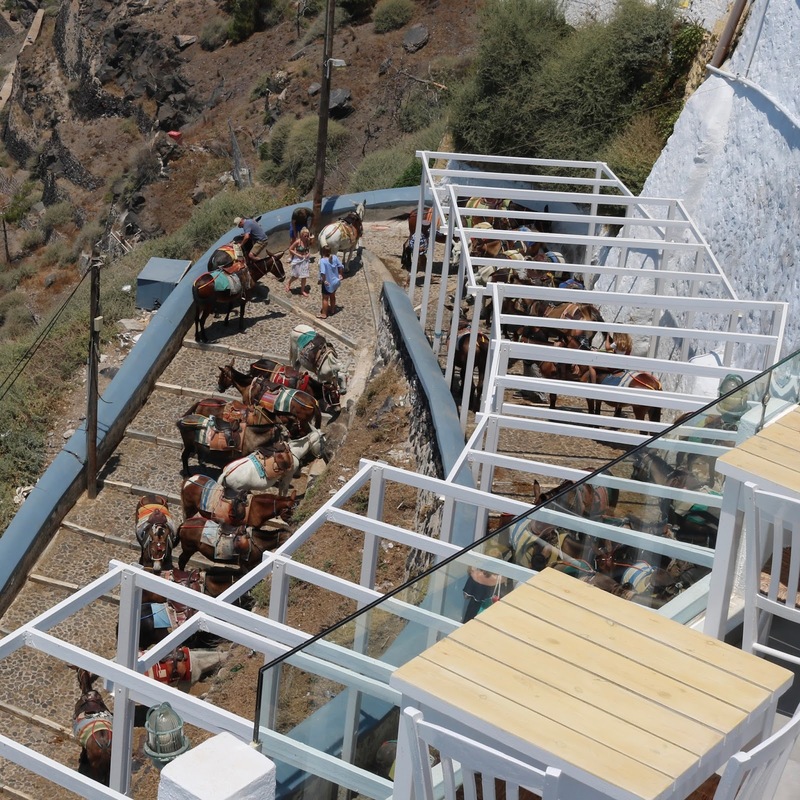 The donkeys in Santorini are promoted as a tourist attraction and you can pay around €6 for a donkey ride from the port at Fira up 500 steep steps into the town. The donkeys are kept in intense heat and sunlight with no shade for up to 12 hours a day and they are offered no food or water during their working hours as the owners don't want them urinating and defecating where the tourists are walking. As if all of that wasn't bad enough they are then forced to carry heavy tourists up and down these steps all day. I've also read reports of donkeys looking malnourished and having open wounds visible. What is worst of all is that there is a cable car ride directly opposite which should mean than no one uses the donkeys in this way but unfortunately they still do. It's very sad to see and I personally do not understand how anyone can contribute towards such cruelty but sadly people still do. We also saw a lot of stray dogs and cats during our stay which was at times very sad but we did all that we could whilst we were there to help them with some food and water. I couldn't stop crying when a family of skinny kittens arrived on our terrace one night, it was truly heartbreaking to see such poorly animals struggling to survive. Every day after that we fed them whilst we were in Oia and then when we arrived at Kamari Beach we found another stray mum cat and her two poorly kittens who looked like they were on deaths door. I am glad we were able to help them whilst we were there, I just hope other tourists also show kindness and compassion too. To the locals these animals just seem to be a nuisance which is a real shame. It costs nothing to put down a bowl of water but so few people seemed willing to help them. It was however heartwarming to see and meet others who care about animal welfare. There is also the one silver lining of the Santorini Animal Welfare Association who are doing some amazing work on the island, particularly with stray dogs and the donkeys. They are a non profit organisation who rely on donations and I would ask that if you are able to then please donate to them or pay them a visit if you are travelling to Santorini. Hire a car or an ATV - it's the best way to get out and about and explore everything the island has to offer. 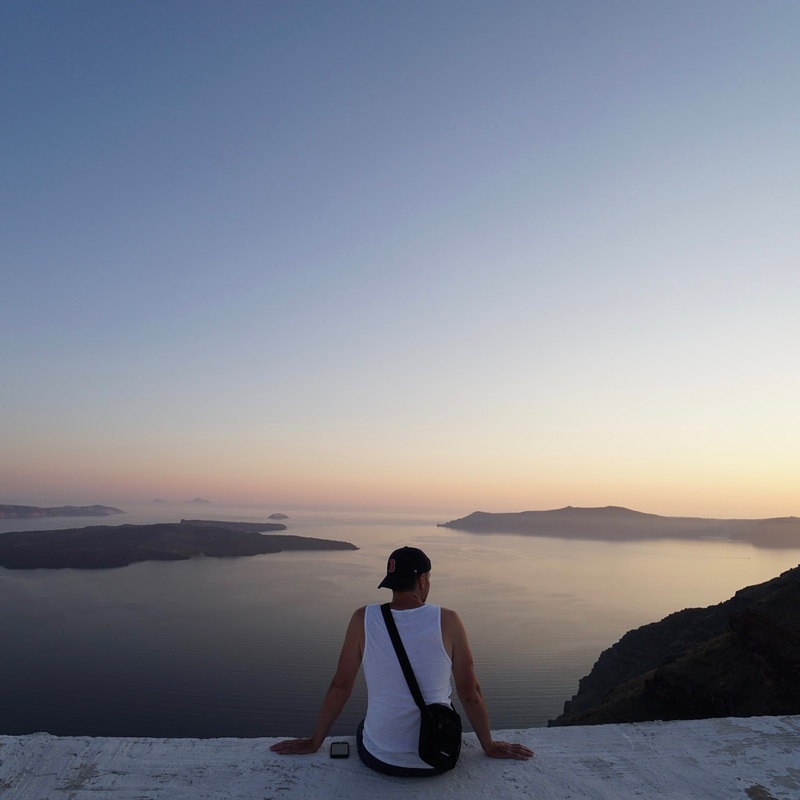 If you are on a budget stay on the Kamari beach side of Santorini and travel into Fira, Imerovigli and Oia to see the spectacular views and explore the towns. If you see a restaurant you like the look of be sure to make a reservation to secure your place or you may be turned away. Make sure you pack some comfortable walking shoes particularly if you intend to explore the towns. Many of the paths are cobble stones and there are a lot of steep steps. If you enjoy sunbathing make sure you book a hotel with sun loungers and a pool or an outdoor tub. Not all hotels have these facilities and the heat can be very intense so it's great to have an area where you can cool off and chill out. If you see stray cats or dogs always offer them some water and food if you can. We ended up buying cat food to feed a skinny family of stray kittens near to our villa and it felt good to be able to help them. We visited at the end of June and the heat was extremely intense with it being between 32-35 degrees every day. If you like it a little less hot then perhaps consider visiting a bit earlier in the season. When you arrive on the island be sure to call ahead to your hotel and advise them of your arrival time so that they can help you with your luggage (especially if you're staying where the caldera view is!). Take it from me - attempting to struggle down those steep cliff edge steps with your luggage is not fun! DO NOT RIDE THE DONKEYS! All in all our time in Santorini was amazing and it was a truly unforgettable holiday destination for so many reasons, some better than others. I experienced so many different emotions during our stay and if like me you are an animal lover and you plan to visit Santorini, you definitely need to be prepared to feel some sadness. Those feelings aside, it is a spectacular destination which i'm so pleased to have experienced for myself. I will never forget the views, the heat and all of the furry friends I made along the way.